I found this at The Tablet UK archives. It is a toast that Cardinal Griffin gave in honor of Msgr. Knox in 1955. I have included a few highlights, as well as a bit of Knox's response. For the entire article, go here. "The first appearance of his translation of the New Testament was awaited eagerly. It found its critics and it found its admirers, but the only point on which there was universal agreement was that here for the first time were the epistles of St. Paul in understandable form." "I need not here go into the problems which arose concerning the authorization for the translation of the Old Testament. I regard it as a great privilege to be proposing this toast today because I can say with personal satisfaction that throughout these years Monsignor Knox enjoyed my full confidence and support. You will know that the Old Testament appeared in two volumes. It appeared first by my single authority, but I am happy to relate by the spring of 1953 Monsignor Knox's translation of the entire Bible was formally authorized by the Hierarchy for public use throughout England and Wales. In this they have now been followed by the Hierarchy of Scotland. Soon afterwards the decision was reached to produce a definitive one-volume edition of what is now called the Knox Bible, and it is to celebrate this publication that we have gathered today to pay honour to the translator. I am very grateful to the Directors of Messrs. Burns Oates and Washbourne for arranging this function and I take this opportunity of thanking them for their co-operation in the publication of the various volumes which have appeared in the past twelve years. I know that they share my pride in a work well done. Monsignor Knox would also wish me to thank the various scripture scholars who have advised him at every stage of his work. They share in the glory of his achievement." "It is as the translator that we pay him honour today, but I doubt if there is a person here today who does not regard Monsignor Knox as his own friend. 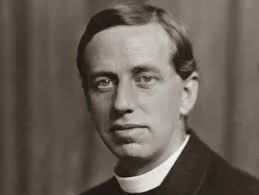 Here is a priest whose scholarship in no way conflicts with his simplicity of character and I know that he is as much at home in a humble presbytery as he is at the high tables of the great. He also enjoys the happy wit which never offends against charity, and it is this which has endured him to so many. His contribution to scholarship and to the Church's literature in this country is probably unrivalled in this century. He is now part of our spiritual armoury, and I am reminded of the lines of Samuel Butler, who wrote of those who "Prove their doctrine orthodox By apostolic blows and knocks." "The book which has coalesced today into a single volume has come to be known, not by my wish, as the Knox Bible. Such a phrase dazzles you, for a moment, with a hint of immortality ; but a little reflection will convince you that there is no immortality about lending your name to a product. Become a household Word, and you are speedily forgotten. What housewife ever wastes a thought on the memory of President Hoover ? What traveller even recalls the existence of George Mortimer Pullman ? In what refreshment-room will you find a portrait of the fourth Earl of Sandwich ? The Knox Bible has become a mere name ; already, several years back, a Downside boy, doing a history paper on the sixteenth century, informed the examiner that 'John Knox was a cruel Protestant ; he wrote a book we have today, the Knox Bible.' But the name is worse than ambiguous ; it is, I think, positively misleading. It suggests a one-man show ; whereas today, looking back over the last fifteen years, looking round at the company which has honoured this occasion with its presence, I see the Knox Bible as anything but a one-man show. I see it as produced by a conspiracy of kindness on the part of many. And because only I can assess the extent of the debt in question, I am glad to have this opportunity of acknowledging it." "Only the lynxeyed compositors of the Cambridge Press know what a lot of difference there is between the Knox Old Testament of 1949 and the Knox Old Testament of 1955. On the very first page, there is an alteration which I should never have had the courage to make if Father Richards, of Old Hall, hadn't gingered me up to it." "Will it live to become dated ? According to a reviewer in The Times Literary Supplement, a translation of the Bible gets dated in fifty years. Will somebody suggest, fifty years hence, 'It is time that the Knox Bible was revised, and brought up to date ? ' Then, oh, then, gentlemen, I have a charge to leave with you. If any such suggestion is made, then let the youngest person who is present today rise in his bath-chair and cry out, `No ! The whole point and protest of the Knox Bible was that it is a mistake, this continual revising and refurbishing of existing Scripture translations, this continual cutting down of father's pants to fit Willie. To revise the Knox Bible would be a treachery to the memory of its translator. If it is dated, then let it be scrapped ; let somebody else sit down and undertake the whole task afresh, in a style of his own, and with a treatment of his own ; let him give us, not a pale rehash of the Knox Bible, but a new Bible, and a better ! ' "
Tim-thanks for sharing this. It was very insightful. I find kind of a strange irony in Msgr Knox's comments about not revising the Knox and instead just starting fresh anew. I wonder if that sort of advice might be needed on this side of the pond at the C.C.D. - we're on our fourth iteration of the NAB (not counting the Confraternity-Douay-NAB hybrids in the 50's and 60's) with a fifth already being contemplated. Frankly, I dislike having to check the title page of a NAB or Confraternity Bible to see which mix of translations is included. That's the nice thing about a Jerusalem/New Jerusalem Bible or a NRSV-CE - it's a single translation, not a series of translations. I found his comments about updated his translation fascinating as well. I wonder what he would think of those who have attempted to update the Knox by simply eliminating the archaic 'thees' and 'thous". I agree also with you statement about having a unified bible, so to speak. When you think about the various editions of the NAB out there, as well as the RSV to be honest, it can get a bit crazy and ultimately it leads to an uneven translation. Certainly translations like the Knox, JB/NJB, and NRSV do not suffer from these issues. The reason why the NAB is being revised in parts is because of how ludicrously long it took them to get the first edition edition done. They started work in 1944 and it wasn't completed until 1970. If they were to authorize a full revision, starting over from scratch, it is likely that we will all be receiving Social Security benefits by then.....this long wait creates significant problems that they would rather avoid. I am hoping the forthcoming liturgically correct NAB with revised notes is released with a different name (rather than NABRE.) It would be appropriate, considering how far removed it will be from the 1970 version, and how much improved from the current NABRE. I would not be surprised if it ends up being used internationally, sort of like how the NRSV has its anglicized variant. If it can be done for the Revised Grail Psalter, why not the rest of the Bible? The NABRE is already being used in Africa. Don't get me wrong, I really like the D-R, the Knox, the JB's, and the various King James Bible spin-offs, but none of these really fit the bill as being a wholly Catholic translation with faithfully Catholic notes, both of which reflect up to date scholarship and fidelity to the Magisterium. Msgr. Knox's translation is a work of art, and even a milestone, and I agree with him, we should not mess with it! The NAB, however, has had much potential AND room for improvement from its beginning, and it will be a great blessing for english speaking Catholics when it is finally completed!